The Hataitai Bus Tunnel was opened in 1907 to connect the expanding suburbs of Kilbirnie and Hataitai to Wellington city. Traffic Management (including tunnel closure, bus diversion, de-energising of O/H trolley wires), scaffolding, drilling, drainage works and other associated tasks. The project specification required a high level of technical capability and quality control to undertake the full scope of works. 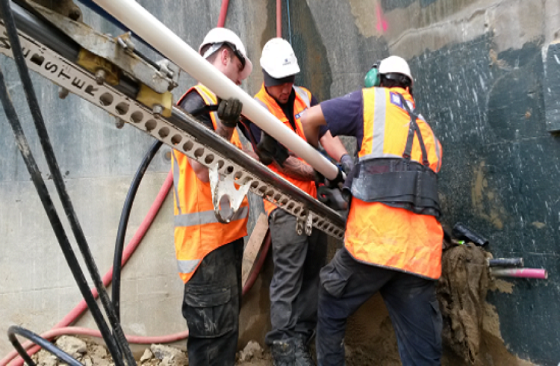 This included water-testing of drilled anchor boreholes, preliminary grouting and re-drilling, post-grouting of all ground anchors over repeated cycles, full-scale pull-out tests on Trial Anchorages, load testing and lock-off of DCP production anchors. Poor ground conditions at some locations were encountered and this lead to additional testing and site survey’s which lead to revised construction details as developed in association with the Engineer.